My read-a-thon mid-week mini-mini-challenge is open until Saturday morning at 8:00am CST. It's a really easy one. Check it out HERE. 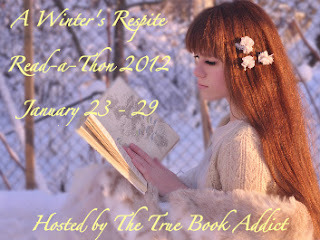 Here's my first novel, (and its review), for the "Winter's Respite Challenge". [I hope this is close to what is required, because I am very confused right now!!!]. I am also using this book for my "Off the Shelf" Challenge!